Yves started his career as an aeronautical engineer with Rolls-Royce in the UK, dealing with Trent 900 engine preliminary design. He then worked for Air France, in the Environmental Affairs Directorate, implementing ISO 14001 certification at the airline and successfully contributing to adopt new ICAO standards for aircraft emissions. Yves then moved to Air France Cargo’s Fleet and Business Planning team, completing several aircraft conversion and acquisition projects, as well as managing the build up of the airline’s new 5-year strategic plan in the frame of the merger with KLM Cargo. 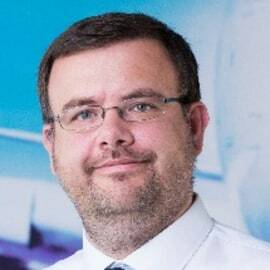 Yves now leads the Airbus team in charge of running network and fleet planning projects with our customers all over the world. Yves holds a Masters degree in Aeronautical Engineering from ISAE-SUPAERO, Toulouse, France.